Sweet little dogs, sleepy owls, rain clouds and contemplative girls feature in this lovely collection. The colour palette is warm, in muted pinks, greys with pops of contrasting mustard and dark blue. 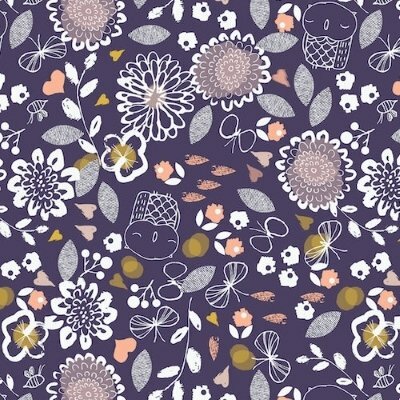 Sleeping owls, butterflies and contemporary florals in pink, mauve, mustard yellow and white on a deep blue background make this a striking fabric. The owls measure approximately 4cm tall. Please note the price is for 1 Fat Quarter of Dashwood studio fabric. For 1/2 Metre of fabric, add 2 units to your shopping bag. For 1 Metre of fabric add 4 units etc.